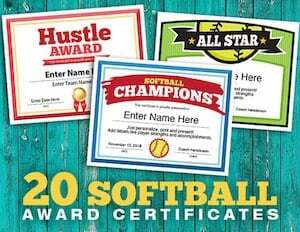 These Softball Team Award Certificates provide a great solution for a softball coach or team parent to recognize players and coaches. You can personalize certificates with things like: player’s name, words of praise, coach’s name, date, team name, etc. Colorful and stylish, the certificates are nice enough to frame. But, most players will feel comfortable posting to a bedroom wall, kitchen refrigerator or bulletin board. There’s 20 different certificates that you can use year-after-year. Lots of choices. 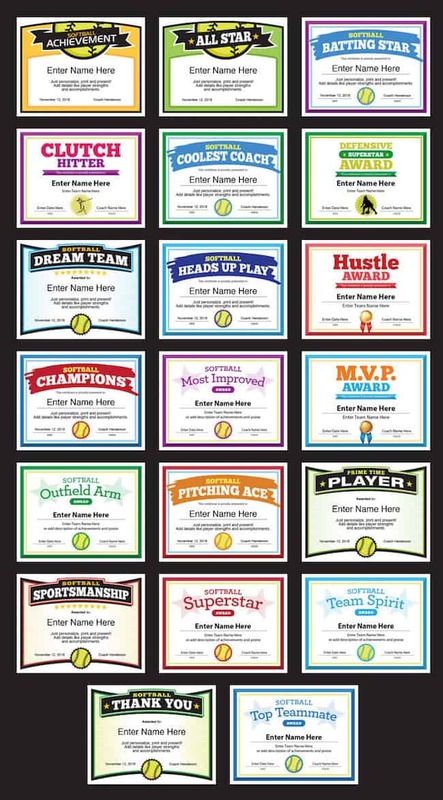 Some softball coaches might decide to award all players the same certificate. Others may elect to pick and choose based on the certificates title and player’s strengths. It’s your call! You’ll receive a bundle in the form of a pdf document with instructions on the first page on how to use. It’s easy and what-you-see-is-what-you-get. Works on both Macs and PCs. You just need to have Adobe Acrobat which is available free of charge. Who doesn’t like to receive some recognition? Players and coaches enjoy these certificates. Put a smile on a face with this collection. 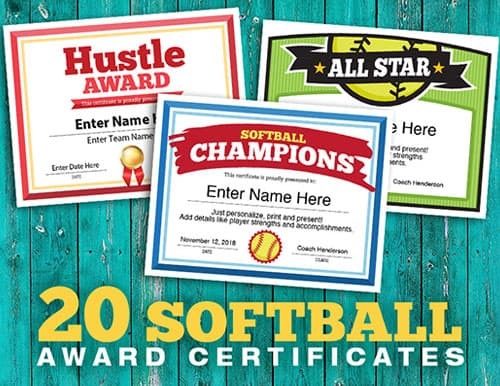 These personalizable certificates are great for season-ending banquets to recognize players and coaches, but you may elect to distribute some of them after a big tournament or at the midway point in the season. When players need a little pick-me-up, some recognition can go a long ways for confidence. Great Designs with many to choose from. There’s something for everyone, and they all look great. Confidence is important for players of all ages. What better way to build some self esteem for players than to recognize their efforts by letting them know how they’re doing. Personalization! Customize each certificate to make the award personal for each player and coach.